This kind of tour which really just concentrates on one species is a specialist trip but we feel that is the way to work with certain subjects. We have traveled to many Puffin colonies throughout Europe and our location for this trip is one of the best for this sort of approach. We will look to be working with these beautiful birds in the best light and certainly the best setting that we could hope for. The Puffin’s chicks will have hatched in their underground burrows and so the adults will be carrying beaks full of fish with the added bonus of standing in carpets of pink thrift, it just couldn’t get any better. These beautiful islands are well known to us with a multitude of visits over the years, and this wealth of experience will guarantee that we will go to the best locations, at the best times, in the best light. Day 1: We plan to arrive at Sumburgh Airport on Mainland Shetland in the afternoon from where it is just a short transfer to our hotel. After dinner, weather and travel tiredness willing, we will stretch our legs and look for some first photography at a local arctic tern colony. Day 2: After breakfast we will set off to Tingwall airport for our island hopping flight to Fair Isle. The plane is only a small Island Hopper and only carries 7 people and we plan to take the morning flight. There is only this one flight in the morning and there are weight limitations of 15kg per person. This weight restriction includes everything for your stay on Fair Isle ie. your camera gear, clothing and essential toiletries. The weather conditions in the Shetland Isles are very unpredictable. Sea Fog is our main concern as the planes don’t fly out in these conditions but the ferry does sail and so should we have difficulties with our flights today we have the safety net of getting on the Island via boat the following morning. Be prepared for a potential boat journey as an alternative should it be necessary. Fair Isle is one of the remotest inhabited islands in the UK with a population of around 60 people. We will be met at the small landing strip and will then transfer to the bird observatory which will be our base for the week of puffin photography. 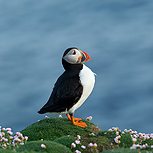 After dinner we will head out to the puffin colony for an evening of photography. Day 3: We have designed this trip to really concentrate on photographing puffins: we think this is one of the best colonies in Europe to do so. The colonies on Fair Isle are not huge by comparison to other locations; it is not the remotest colony either. It is though without doubt one of the finest locations in Europe to get images of this beautiful bird. The setting and quality of the light is what sets it apart allowing for morning and evening photography and the chance to experiment with front and back lighting too. We will be mainly working in the very early mornings or late evenings if the weather conditions are in our favour or throughout the day if we have cloudier conditions. Days 4 – 7: The days will follow the same pattern and we will be visiting the various colonies that are dotted around the island. The main colonies that we intend to visit are within walking distance of our accommodation but we will have the option of trying a couple of other locations, which are slightly further afield. 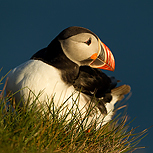 Fair Isle is also an excellent place for other subjects like great and arctic skua, wheatears and meadow pipits so if you do get bored with the puffins there are always other subjects to work with. Day 8: Our last morning on Fair Isle for the puffins and then we have to catch the small plane back to Tingwall on the Mainland: the boat is scheduled to leave today offering a similar contingency for our return journey. We then transfer back to Sumburgh Head hotel and if you still want to try for more shots we will either head back out to Sumburgh Head for another session with this charming bird or again visit the local arctic tern colony. Day 9: We have morning or afternoon flights out of Sumburgh Airport back to our chosen destinations and will arrange transfers to the nearby airport to meet up with them accordingly. Airport transfer and all transportation on Shetlands, accommodation, meals, island internal flight. Travel to Shetlands, sundry items and alcohol. We have comfortable hotel accommodation on Mainland Shetland and on our island base we’ll stay in a very comfortable research station. Accommodation is based on twin rooms. Single supplements are potentially available on request. The Puffin colony is only a short walk from our base and is not a difficult walk although it does involve an incline. There is an option to do longer walks to other colonies. Although the weather is inevitably variable here, when good we will be looking to make the most of the best light early and late in the day.